Very attractive, typically with a first day canceled single of the issue and related illustrations and text. Perfect for framing! 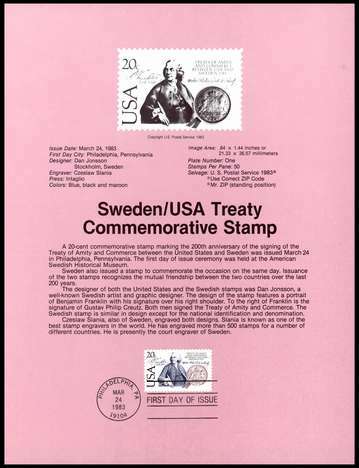 March 24, 1983, US-Sweden Treaty of Amity and Commerce. Slania-engraved issue. A joint issue with Sweden, picturing Benjamin Franklin. 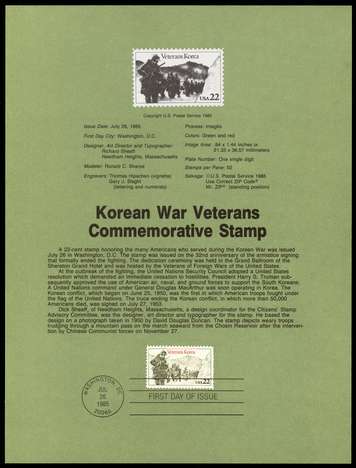 July 26, 1985, Korea Veterans. Slania-engraved issue; originally attributed by the U.S. Postal Service to a different engraver (due to "buy American" political considerations), but now revealed to actually have been engraved by Slania. 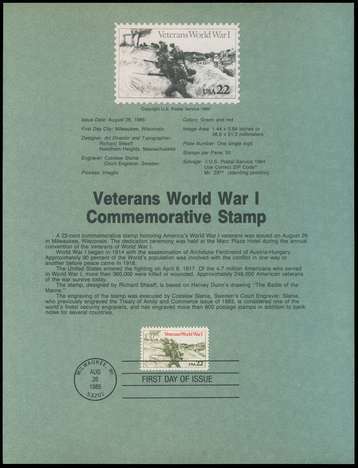 August 26, 1985, WWI Veterans. Slania-engraved issue. Need several. Please make offer. If BuyIt button is not present, please let me know that you seek this item. 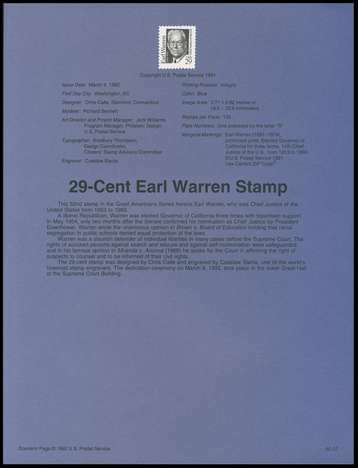 March 9, 1992, Earl Warren. Slania-engraved issue. 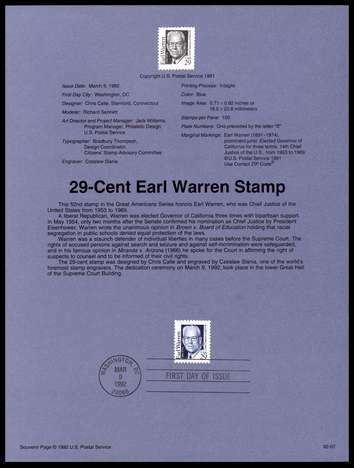 March 9, 1992, Earl Warren. Slania-engraved issue. Mint page without stamp affixed and without FD cancel -- very scarce thus! 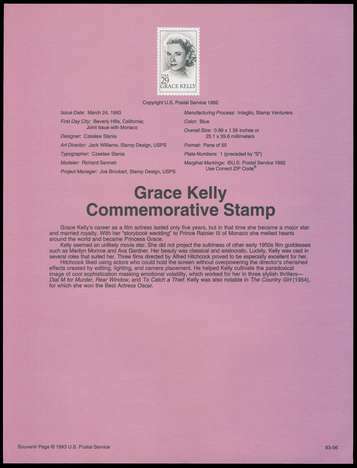 March 24, 1993, Grace Kelly (later Princess Grace of Monaco) #93-06. Slania-engraved issue. Joint issue with Monaco. Scarcer souvenir page. 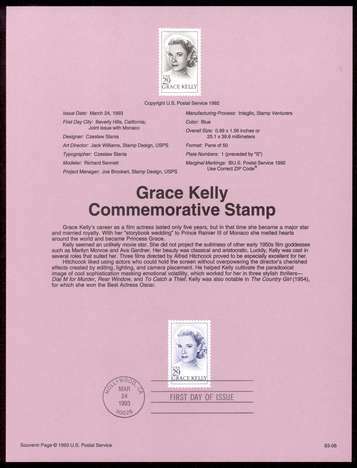 March 24, 1993, Grace Kelly (later Princess Grace of Monaco) #93-06. Slania-engraved issue. Joint issue with Monaco. Mint page without stamp affixed and without FD cancel -- very scarce thus! 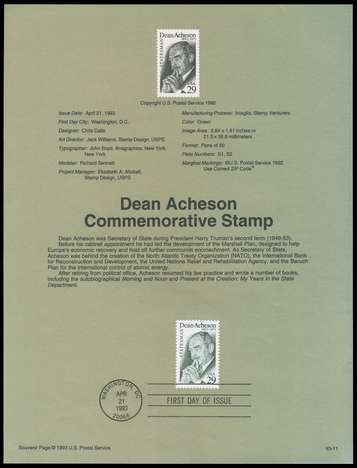 April 21, 1993, Dean Acheson. Slania-engraved issue. 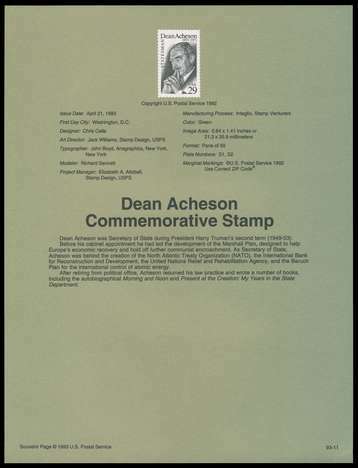 April 21, 1993, Dean Acheson. Slania-engraved issue. Mint page without stamp affixed and without FD cancel -- very scarce thus! 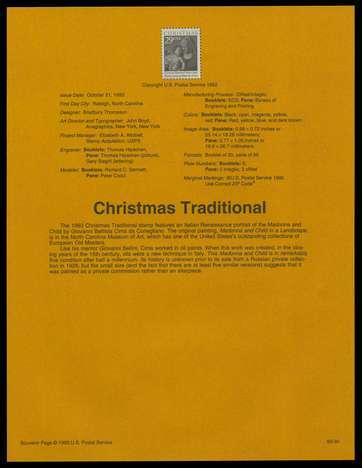 October 21, 1993, Christmas 1993 issue #93-30. This page bears both the sheet stamp and the booklet pane; only the booklet pane is a Slania-engraved issue. Many people have commented that they prefer the engraving of the sheet stamp instead of the Slania engraving; this is a nice item to compare the two. The text on the page incorrectly states that Hipschen engraved both issues; Slania actually engraved the booklet issue. 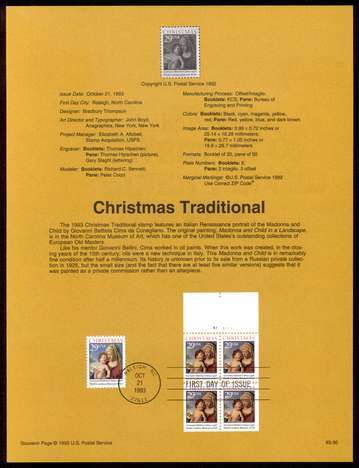 October 21, 1993, Christmas 1993 issue #93-30. This page bears both the sheet stamp and the booklet pane; only the booklet pane is a Slania-engraved issue. Many people have commented that they prefer the engraving of the sheet stamp instead of the Slania engraving; this is a nice item to compare the two. The text of the souvenir page incorrectly omits that Slania was the engraver of the booklet and instead gives credit to Hipschen -- there are various theories why this occurred. Mint page without stamp affixed and without FD cancel -- very scarce thus (I obtained the first I had seen 26 years after it was issued)! 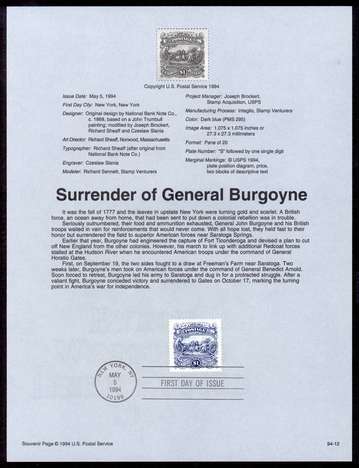 May 5, 1994, $1.00 Surrender of General Burgoyne #94-12. Slania-engraved issue. Somewhat scarcer issue. 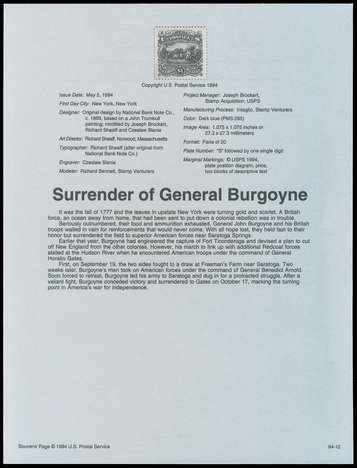 May 5, 1994, $1.00 Surrender of General Burgoyne #94-12. Slania-engraved issue. Mint page without stamp affixed and without FD cancel -- very scarce thus! 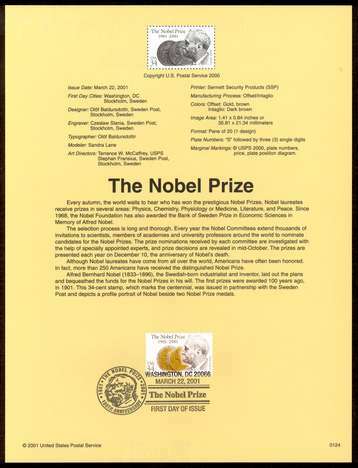 March 22, 2001, Nobel Prize #0124. Slania-engraved issue. Joint issue with Sweden. Scarcer souvenir page in great thematic demand. 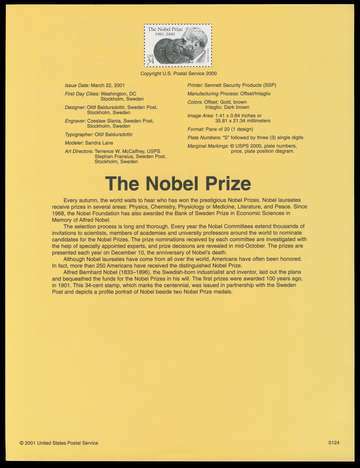 March 22, 2001, Nobel Prize #0124. Slania-engraved issue. Joint issue with Sweden. Scarcer souvenir page in great thematic demand. Mint page without stamp affixed and without FD cancel -- very scarce thus!